The novel “Fossil Hunter” by Robert J. Sawyer was published for the first time in 1993. It’s the second of the Quintaglio Ascension trilogy and follows “Far-Seer”. It won the Homer Award as best novel of the year. 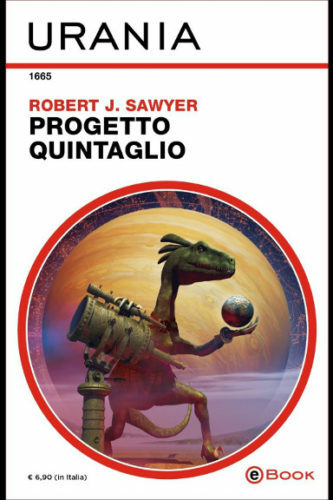 Toroca, one of Afsan and Novato’s children, works on a geological mission that aims to produce a survey of all the existing resources to assess which can be useful in the great exodus that the Quintaglio will have to make to save themselves from their world’s destruction. During that task, Toroca makes some unexpected discoveries such as an object made of a material much harder than anything known and clearly artificial and animals that live at the South Pole that have some characteristics that seem to be those of species known but adapted to aquatic life, as if their ancestors changed over time. Emperor Dybo must direct the operations that will lead to the exodus hoping that Afsan and his other advisers find a way to leave their world but their focus is strongly disturbed. Someone killed one of Afsan and Novato’s children, an event that almost no one remembered among people who kill only when caught by the fury triggered by territoriality. Dybo himself is in danger when his brother Rodlox disputes his right to the throne and challenges him to a fight that can end only with the death of one of them.